The launch will take place from 21:00 to 23:00 this Friday at the Port Charlotte Hotel. After the launch itself there will be a ‘free for all’ session where everyone who plays an instrument can join in. Sounds like a great evening to me. 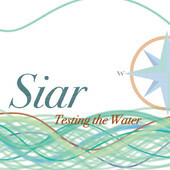 For more information and other updates check the Siar Facebook page and/or the Siar on Twitter account. If you're not on Islay and/or can't make it to the launch, the album is also available online at Google Play and iTunes. I hope you'll like it, I think it's excellent.